The AIANH Intern/Young Architect Design Competition was created in 2003 to provide an opportunity for interns and young architectural professionals to strengthen their design skills, gain recognition, and assist a community with their design challenges. It is open to all New Hampshire architectural interns and architects within five years of registration. Participants do not need to be members of AIA. A jury of professionals judged the submissions, with honors presented at the annual AIANH Awards Banquet January 18. Presentation very readable, and the section was very helpful. Its simplicity is elegant; and the plan offers a lot of opportunities. The entrance is very clear. Very good use of site, allowing for green space and leaving potential for something added in the future. Separate bus and parent drop-offs are good. 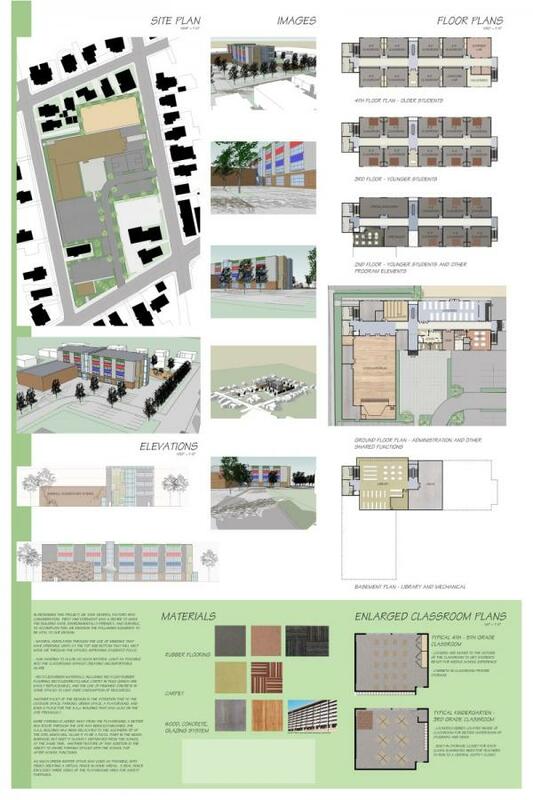 Employs good education philosophy; nice non-traditional classroom layout; good common space and storage. There is a good relationship to outdoor use: parking, playground, entrance, loading, and utilities. The parking is safely separate from traffic and walkway circulation, the playground is linked with classrooms and hallways and is also on the south side offering a sunny space for outdoor recreation. The jurors selected this entry specifically for its creativity. The designer was thinking outside the box and about architecture from the students' perspective. This concept stretches your imagination. There are interesting spaces; it has a campus feel, and accounts for safety. Great potential for greening of space. Clustering is interesting. 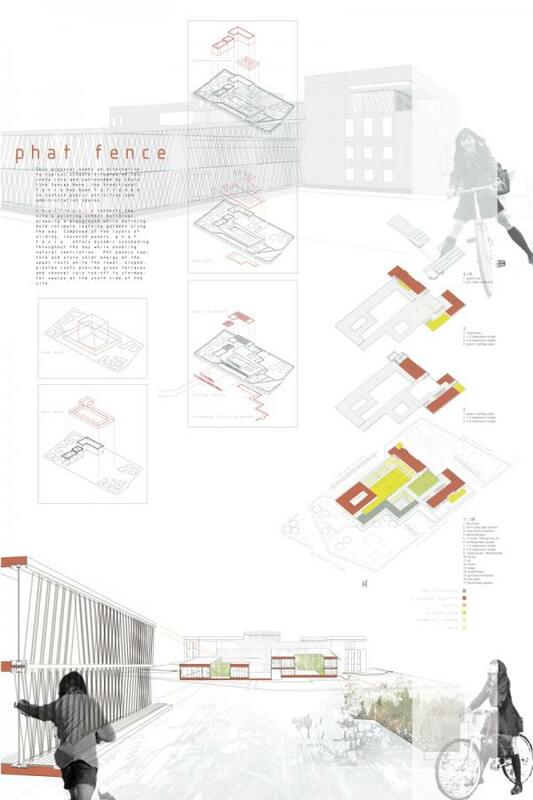 The idea of the fence as an architectural element is great. This is an interesting design, practical, with some creative elements. The functionality is good. 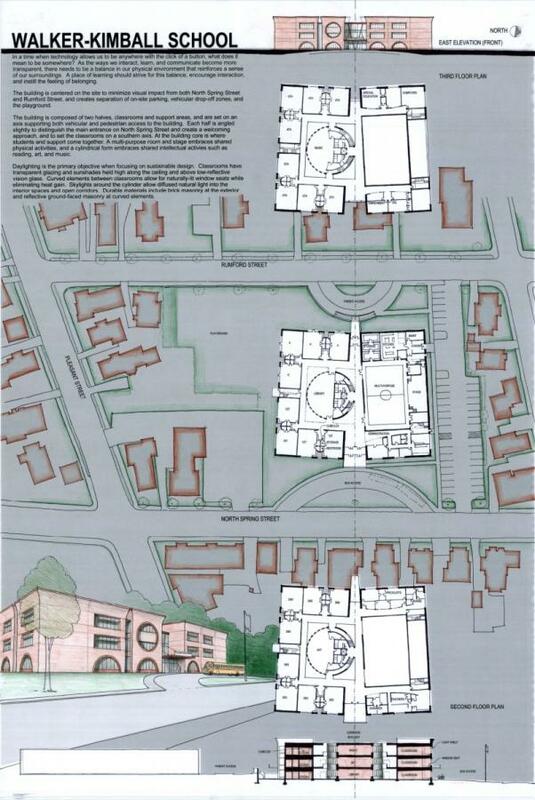 The design leaves some of the site open for future expansion and the layout uses the site well including good parking access for the gymnasium. The designers thought about the children's experience. The courtyard is a nice passive outdoor space that is large enough for some school functions, a sitting area, and additional landscaping. The sun reaches a portion of the playground, and this play area is located near the cafeteria where active recreation is most appropriate.